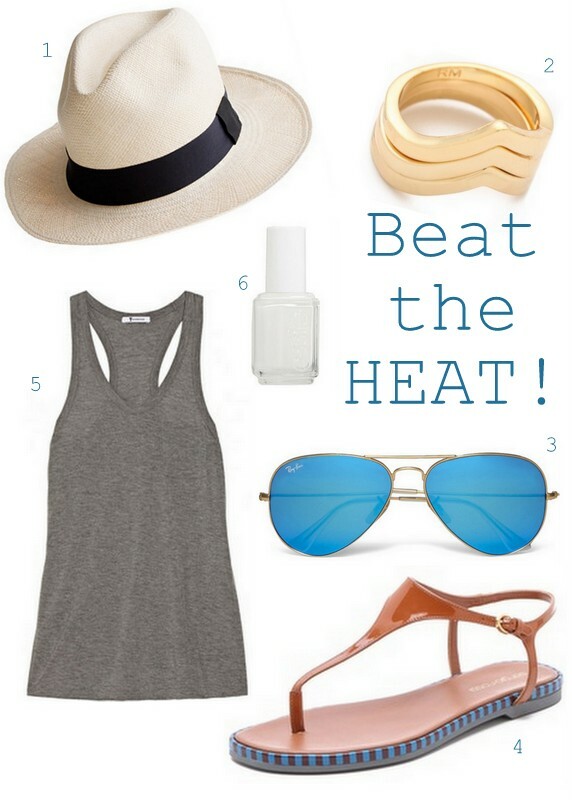 Curly in the City: Beat the HEAT! It's been HOT. It's been HUMID!!! I love the heat, not so much the humidity.....with curly hair I tend to look like a giant frizz ball strolling down the street! With this type of weather I tend to simplify. Less items touching my clammy skin. Shielding me from the sun, staying cool (well, at least trying!) and of course trying to stay semi-cute! I love the mirrored sunglasses trend, especially these bright blue ones (I wish I didn't need RX glasses!) And white nails - I used to hate this, maybe from my HS days of painting my nails with whiteout bored in class! But now, LOVE!!! I know what I want my next mani color to be! How have you been staying cool? How do you 'Beat the Heat'?!!! so funny i just bought the best grey tank yesterday at Club Monaco! I really have been lusting after mirror shades. They're so cool (maybe TOO cool for me to pull off, but whatever!). i love white manicures but i always mess mine up right away. i have been living in dresses this summer because it's too hot for anything else. Gimme those shades. I need them in my life! I hear ya on hot and humid. I am in Austin and this outfit would work perfectly! Well I guess if you add some pants to it. haha. just kidding around, in all honestly this looks amazing. Thanks for sharing! Love all of these picks! Alas, I've been spoiled with a lack of humidity while living in CO the last 8 yrs, but I sure do remember the humidity back east! I'm loving those blue mirrored shades, and I am 100% with you on the white nails! I was late to get on board for the same reason, but now I love it! It's been warm here too...and last night it rained a very tropical rain...unusual for San Diego!